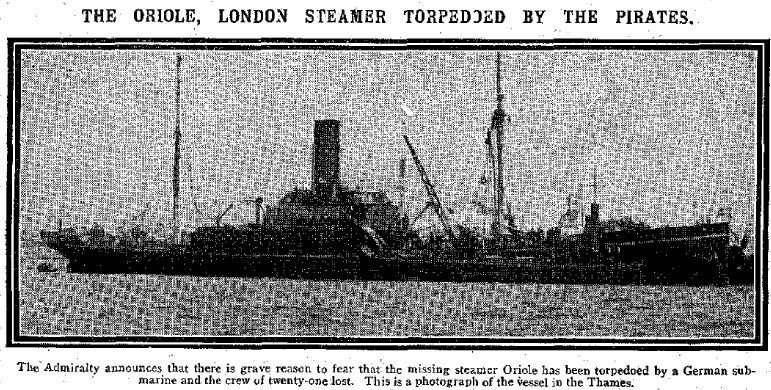 On Friday January 29 1915, the merchant vessel SS Oriole set sale from its home port of London, heading for le Havre in France. It was last seen off Dungeness on Saturday 30th. A few days later two of its lifebuoys were washed ashore on the Sussex coast. The blockades by the Germans against the UK and by the UK against Germany were hugely important in the course of the Great War. Starvation through lack of imported food was a grave risk to both nations. In the end it was the British blockade that had the decisive effect, although the German attacks on merchant shipping in 1915 and 1917 helped to bring the USA into the war, which also helped to tip the balance in favour of the Allied Powers. Our story today, though, comes just before the German navy proclaimed the seas around Britain to be a war zone. The Oriole was a steamer built in 1914 and weighing 1,489 tons, owned by the General Steam Navigation Co of London. On 29 January, it set sail with a normal cargo under captain William George Dale, from Wimbledon; under Dale were 20 other crewmen. On the 30th, the crew of (appropriately named) SS London Trader passed the Oriole off Dungeness. What happened next is not definitively known. On 6 February, two lifebuoys from the Oriole were washed up on the shore at Rye. On 20 March, a bottle was found by Guernsey fisherman containing a message written by the Oriole’s carpenter: “Oriole torpedoed – sinking”. By that time, the vessel had already been declared lost, and along with it all 21 lives aboard. It is thought that the Oriole was sunk by submarine U20, captained by Kapitänleutnant Walther Schwieger. That same submarine struck two other vessels that day: the Ikaria, which had sailed from Buenos Aires, and the Tokomaru, which had come from New Zealand. The crew of the Tokomaru managed to get away before it sank and were taken to Le Havre; the Tokomaru stayed afloat and was towed into that same port but was taken back out and sank on February 2nd. Nothing was seen of the Oriole, the vessel on the shortest journey. “The British steamship Oriole, of the General Steam Navigation Company, which left London on January 29, was due at Havre the following day. She has not arrived, nor is there any news of her whereabouts, except that two lifebuoys marked ss. Oriole were picked up near Rye last Saturda. “When about twenty-five miles N.W. of Havre, 12.30 on that day, I was on the bridge with the chief and the second officer when we saw the wake of a torpedo coming towards the ship at about 30 ft. from the ship. The ship was stopped at the time for the purpose of getting a pilot as two tug-boats were coming up with flags to the fore. About a second after we saw the wake of the torpedo we were struck in the fore part of the ship on the port side. An explosion occurred, and a volume of water, mixed with cargo, cement, and parts of the torpedo, arose about 60ft. and fell on the deck. Robertson and his crew were lucky; they got away onto the tug. According to naval history dot net, the attacks by U20 were the first ships sunk without a warning by the submarine crew. Robertson had 30 seconds’ warning after spotting the torpedo, the Tokomaru crew spotted the periscope as they were attacked; we do not know what warning, if any, Dale and his crew on the Oriole had. ARDY HENRY JOHN ALFRED WILLIAM 42 Cook HUSBAND OF FLORA ARDY, OF 9, KINSALE RD., PECKHAM RYE, LONDON. BROOKE W S 53 Assistant Steward BORN IN LONDON. DALE WILLIAM GEORGE Master HUSBAND OF MRS. M. L. DALE, OF 17, CAMBERLEY AVENUE, WEST WIMBLEDON, LONDON. FISHENDEN FREDERICK CLIFFORD 31 First Mate HUSBAND OF ISABEL DAISY ELLYCE FISHENDEN (NEE MILES), OF 47, PORT HALL RD., PRESTON, BRIGHTON. HARGRAVE JAMES WILLIAM 43 Boatswain and Lamps HUSBAND OF ALICE ELIZABETH HARGRAVE (NEE JEFFERY), OF 78, ST. LEONARD’S RD., SOUTH LOWESTOFT. HOLLAND THOMAS WILLIAM 23 Ordinary Seaman SON OF ANN ELIZABETH HOLLAND, OF 15, DOVE ST., LOWESTOFT, AND THE LATE ROBERT HOLLAND. LYNCH TIMOTHY JAMES 30 Fireman and Trimmer SON OF THOMAS LYNCH OF 20, STOREY ST., NORTH WOOLWICH, LONDON. MULCAHY WILLIAM GEORGE 28 Fireman and Trimmer SON OF MRS. MARY MULCAHY, OF 1, CORRIG CASTLE TERRACE, DUN LAOGHAIRE, CO. DUBLIN. PIERCE GEORGE REGINALD 31 Second Engineer HUSBAND OF ETHEL VINE PIERCE (NEE BULLEY), OF 5, BURLINGTON TERRACE, CHISLEHURST, KENT. SADLER JOSEPH ROBERT 30 Fireman and Trimmer HUSBAND OF ELLEN CATHERINE SADLER (NEE STEIN), OF 33, CHANCERY BUILDINGS, BEWLEY ST., CABLE ST., LONDON. SCHAFER JOHN GEORGE 30 Fireman HUSBAND OF ELLEN LOUISA SCHAFER (NEE MARCH), OF 71, HARCOURT AVENUE, MANOR PARK, ESSEX. STATHAM HENRY GEORGE 23 Third Engineer HUSBAND OF SARAH ELIZABETH STATHAM (NEE SMART), OF 63, QUEEN’S RD., BAYSWATER, LONDON. SWAIN REUBEN FRANK 50 Carpenter HUSBAND OF ELIZA MARIA SWAIN (NEE SMIZZEN), OF 12, MAYVILLIE RD., ST. PETER’S, BROADSTAIRS, KENT. THOMSON OSWALD 51 First Engineer HUSBAND OF JANE MERCER (FORMERLY THOMSON, NEE BORTHWICK), OF 11, CLARENDON RD., LEWISHAM, LONDON. TODMAN NELSON VICTOR 27 Second Mate HUSBAND OF ANNIE GERTRUDE TODMAN (NEE MITCHELL), OF OAKWOOD LODGE, OLD RD., CRAYFORD, KENT. WALFORD EDWARD CHARLES 35 Donkeyman HUSBAND OF ANNIE POND (FORMERLY WALFORD, NEE STOKES), OF 51, LIVERPOOL RD., CANNING TOWN, LONDON. As you can see, most (10 of the 16 with additional details) were Londoners by origin or residence. I don’t know what wives like Sarah Elizabeth Statham in Bayswater or parents like Thomas Lynch in North Woolwich were told during the days after the loss. * Did they start to mourn straight away, or wait until the presumed deaths were official six weeks later? All 21 men are now commemorated on the Tower Hill memorial to merchant seamen lost and sea. A few weeks after the loss of the Oriole, Ikaria and Tokomaru, the Germans declared their first major submarine campaign with its attacks without warning. A few months later the same submarine – U20 – sank the RMS Lusitania, sparking outrage in the UK and the USA. A renewal of unrestricted submarine warfare in 1917 helped to finally bring the USA into the war. Many more men and women lost their lives during the war at sea in 1914-18, but these 21 men were among the first of this period of increased aggression by the German Navy in 1915. * The next of kin details were collected after the war, which explains why some of the wives have new surnames. Maurice Leigh Gardner was killed in a tragic air crash just as he was about to set out on his career as an officer in the Royal Flying Corps. Maurice Leigh Gardner was born in 1886, the son of Frederick Leigh Gardner and his Cape Town-born wife Miriam Gardner. Living with his father (and a domestic servant) at 14 Marlborough Road, Gunnersbury in 1911, he is described in the census return as living on ‘private means’. Frederick Leigh Gardner was similarly described – he had been listed in the 1891 census as a ‘dealer in stocks and shares’, but early in the new century gave that up and became an occultist, bookseller and author. In the summer of 1914, Maurice Leigh Gardner took up flying lessons at the Beatty School at Hendon (run by American aviator George W Beatty). After a few months’ training, he passed his flying test on a Wright biplane and earned his Royal Aero Club Certificate (No. 1002). At the same time he must have applied to join the Royal Flying Corps because on 19 January 1915, the London Gazette carried a notice that, as of 11 January, he was a Second Lieutenant in the RFC Military Wing. That same day, 19 January, disaster struck. Flying in a Maurice Farman biplane at Farnborough, Gardner had completed a number of manoeuvres and was approaching the aerodrome at around 4.30pm. Suddenly the aeroplane dived and ploughed into the ground, engulfed in flames. RFC comrades were soon on the scene and extinguished the flames as quickly as possible, but Gardner was dead and his body charred by the time he was pulled from the wreck. Accounts vary about exactly what happened. Initial reports were that the aeroplane had mysteriously caught fire in the air (this was reported in Flight magazine and the Daily Mirror). However, the inquest found that the fire occurred after impact, when the fuel tank crashed into the engine. 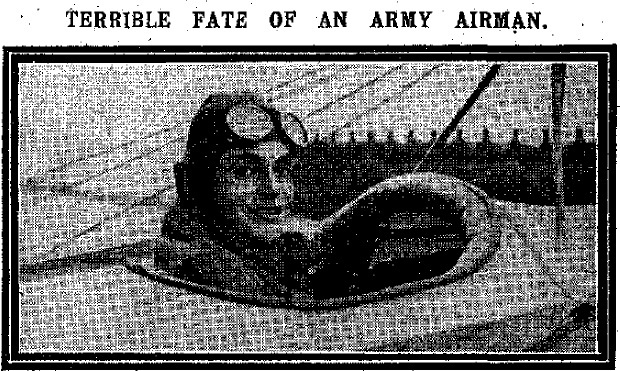 Either way, like Henry Ralph Lumley a few years later, Gardner’s nascent flying career came to a horrible end just as it was beginning. He is now commemorated in Golders Green crematorium. At 7.30am on 12 January 1915, a firing squad was assembled behind the British lines on the Western Front. Its grim task was to carry out the first double execution of British soldiers in the war. Those men were Private J Ball and F Sheffield of the 2nd Battalion, Middlesex Regiment. This is Joseph Ball’s story. 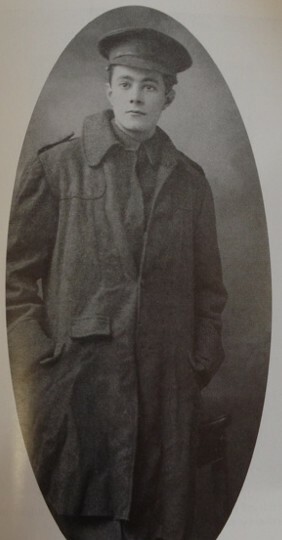 Joseph Ball was born in West Kilburn; by 1912, he was 18, working as a van guard, and apparently keen to join the army. First up, he joined the Special Reserve (which could be called up in wartime) in the 5th Battalion of the Middlesex Regiment, in May. Then in August, he enlisted full-time as a soldier in the same regiment’s 2nd Battalion. He is described as fresh of complexion, with dark brown hair. Ball served with the unit in England for a year before it went to Malta in September 1913. In his peacetime service, Ball was far from the perfect soldier. Every month or so, he was punished for some misdemeanour: untidiness, dirtiness, having a rusty rifle, not complying with orders, absence from parade and falling asleep while on sentry duty. The punishments ranged from brief detention, to a few days confinment to barracks, to simply an admonishment. 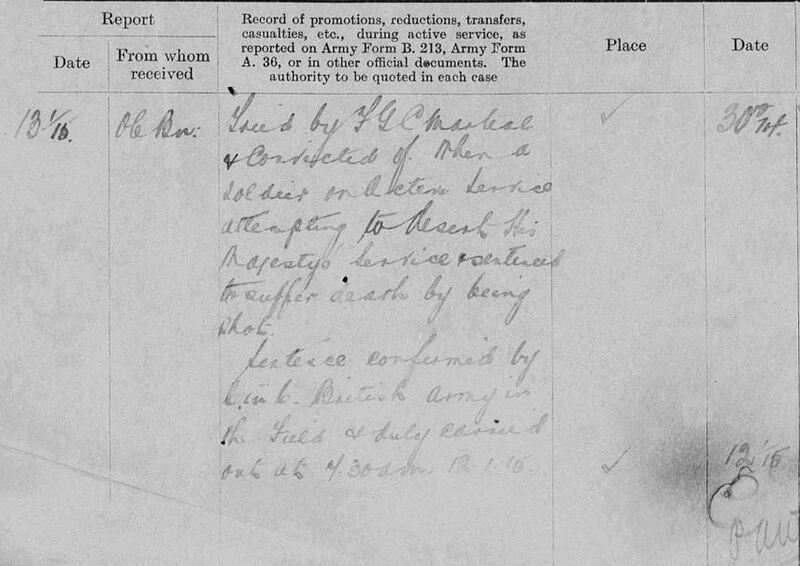 It was not at all unusual for new recruits to be rejected as unlikely to become an “efficient soldier”, although in this case the application was for discharge as no longer required. In the year to September 1912, over two hundred recruits were rejected by the army within their first three months’ service for reasons over than medical; the following year the figure was 148. Around 400 were rejected on medical grounds in that same period after enlistment. Sadly for all concerned, this officer’s recommendation for Ball’s discharge was not heeded. The soldier stayed in the Company; his annual reviews reported him (perhaps surprisingly) as of “Fair” military character, but noted that he was “Untidy and unreliable. Weak intellect”. Details of Ball’s trial and execution, from his service record. The Field General Court Martial convicted them of “when a soldier on active service attempting to desert His Majesty’s Service and sentenced [them] to suffer death by being shot.” Field Marshal Sir John French confirmed the sentence, and the two men were shot on 12 January 1915. They are now remembered on the Le Touret Memorial in France. It seems from Joseph Ball’s service record that the 2nd Battalion, Middlesex Regiment, let themselves and this young soldier down terribly. Despite his clear inadequacy as a soldier, they kept him on for some reason, punishing his misdemeanours but not sending him back out into civilian life. When it came to the Great War, they took this unreliable soldier with them to France, and when he deserted, ruthless punishment ensued and he was executed. Men and women at war often long for home. Quite what their image of home is can vary. During the Great War, an effort was made to provide a positive, homely and nostalgic vision of London for soldiers returning here on leave (or passing through). Illustrator and writer Will Owen produced words and images evoking ‘old London town’. When service personnel arrived on the leave train at one of the London terminal stations in the last six months of the war, they could pick up the free weekly newspaper ‘Welcome’ from WH Smith. It provided those on leave with practical information about getting around, where they could find accommodation and how they could avoid scammers. Much of the material was produced by the propagandist National War Aims Committee. Among those things, there was also a regular series called ‘bits of old London town’. This consisted of line-drawings and brief, chatty descriptions of old bits of London – buildings and things in the street that evoke a sense of London’s history. William Widden Owen was born in Malta in 1869 but grew up in London. In 1881, he lived with his parents Thomas and Mary Elizabeth in Brixton; by 1891 he was a Government Clerk at the Post Office Savings Bank, still living with his parents, now at 35 Mervan Road. In around 1898, he married Irishwoman Margaret Florence; in 1901 they were living in Richmond and by 1911 they were raising their two daughters in Deal, Kent. By then, Owen’s profession is listed in the census as ‘Artist (painter)’ – he was writing and producing illustrations for various magazines. The illustrations are mostly street scenes, but there is very little of the streetlife of the war – the food queues and servicemen and women that wartime brought to the streets of London. 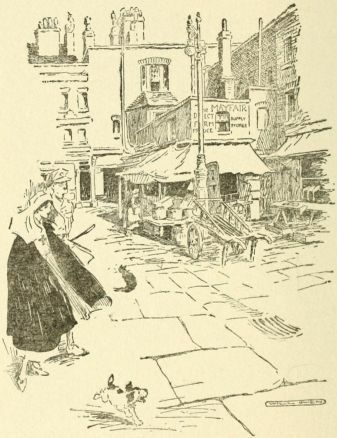 A solitary exception is the illustration of Shepherd Market off Piccadilly, which shows an officer and a nurse. In his thesis on propaganda and the NWAC, David Monger notes the role of these pictures as depicting an idealised British home-front community that servicemen and women were serving to protect. Owen also continued to create more traditional images for magazines such as The Sketch. Lucinda Gosling’s book Brushes and Bayonets includes several examples. After the war, Owen continued his work as an illustrator, including for the London Underground. Gosling describes Owen’s most famous work as the creation of the ‘Bisto Kids’. 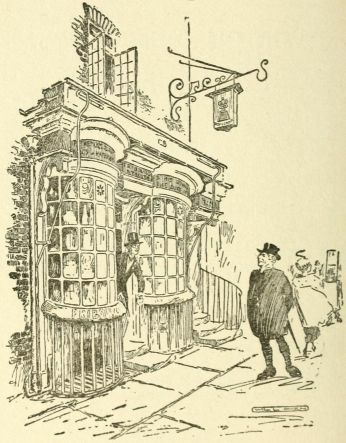 Will Owen’s wartime illustrations for ‘Welcome’ were published in 1921 as Old London Town, which is available in its entirety on Project Gutenberg. The book has the rather nice preface, ‘I make no apology for the publication of this little book – on the contrary’. Acknowledgement: Thanks to David Monger for alerting me to the original use of Will Owen’s illustrations, which is covered in his thesis ‘The National War Aims Committee and British patriotism during the First World War’ and more recent articles. That was a question that was all too often on the minds of soldiers, sailors and civilians during the Great War: when will this war end? Views varied throughout the war on what a realistic answer was. In January 1915, businessman F.S. Oliver wrote to his brother in Canada about the progress of the war and attitudes to it in London. …when will it be finished? The man in the street varies between 3 points of view: Kitchener’s original prophecy of three or four years; the general business man’s view, March 1916 [i.e. another 14 months]; the newspaper (derived from the General staff) optimist, 3 or 4 months. Just now it has made up its mind to the first of these. What can we learn from this? Obviously it is only the observation of one (quite well-connected) man, but it tells us something about views about the war. For one thing it tells us that there was some variation in views, so we cannot simply say that people thought one thing or another. The quotation also tells us something of where he felt the views had come from; the 3-year prediction was a well-known statement of Lord Kitchener’s, when he called for a mass army to be formed. 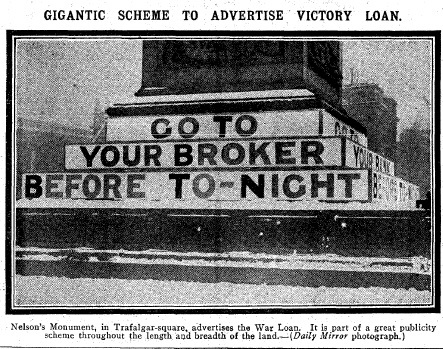 The idea that newspapers and generals were promising a short war is something that has become a major part of our mythology of the Great War. I have written elsewhere about the idea that people in 1914 thought that the Great War would be ‘over by Christmas’. Some may have done, but it was not a widespread belief and is only very rarely expressed in written sources. Soldiers were more likely to say that it would be over so soon, either because they feared not getting to use their training and take part, or because they had taken part and wanted it to be over as soon as possible. Many went from fear of an early end to the war to wishing for it. Henry Williamson (later author of Tarka the Otter) presents a good example of the effect that war service had on predictions. Having predicted at least a year of war in August 1914, he repeated in September that the ‘war looks as if it will be a long one’. After his first spell of service in the muddy, dangerous front line trenches, however, he wrote home that ‘We all think the war will end soon, thank God when it does’. The timing of the recruiting boom of 1914 suggests that men did not join up in droves thinking the war would end by Christmas. The peak of recruiting came in the wake of the British Army’s retreat with heavy losses from Mons – hardly an event to inspire dreams of an imminent victory. The idea that generals and politicians were telling everyone (through the newspapers) that the war would be over soon doesn’t hold much water. The only such public statement that refers to that term that I was able to find (other than in reference to a German belief in an early victory) was from Lord Curzon, the former Viceroy of India, who told an audience at Harrow School in October that he ‘was perfectly shocked when he read in the papers of people talking about the war being over by Christmas [. . .]. In his judgement more than one Christmas would pass before our soldiers returned’. Curzon was using the phrase in exactly the opposite way to how generals and politicians are popularly supposed to have used it – instead of an optimistic promise to persuade men to join up, it was a warning not to think that victory would be easy. “It’ll be over by Christmas all right,” said James again, but without conviction. “Maybe,” I said; “Christmas, 1918, you mean, I suppose?” James called me a rude name, as soldiers will, and relapsed into moody silence. The idea that it was dominant, though, is part of the post-war image of 1914 that has grown up since then, during the later war years and particularly after 1918. In general, it seems that people’s expectations of the length of the war revolved around the big battles and calendar years. Robert Graves notes in Goodbye to All That that soldiers could not really conceive of the war going on for more than another 12 months. When he was conscripted in the summer of 1916, Edwin Bennett from Walthamstow promised his family that the war would end and he would be home again to play with his new daughter within a year. Perhaps surprisingly, people could place bets against the ‘risk’ of peace coming within a certain time period. In 1914, even odds were given on peace by March 1915, but the ‘risk’ of peace within around 12 months decreased gradually from 75% in Spring 1915 to only evens in August 1917. Others placed less formal bets, including many servicemen but also civilians. RWM Gibbs, a Battersea-born teacher then living in Surrey, had such a bet with his outfitter in early 1916 that the war would end that year. Gibbs’s father had made the same prediction a few months earlier. The big set-piece offensives on the Western Front raised and – for the most part – dashed hopes of victory by the end of the year, or by Christmas. The battle of Loos had this effect, but it was much more prominent in 1916 in the run up to the battle of the Somme and, particularly, in 1917. The year had been unofficially declared the ‘year of victory’, with a ‘Victory Loan’ and a memorial unveiled in the East London cemetery dedicated to the fallen of the war of 1914-1917. The failure to bring about victory in 1917 was a huge blow to British morale. Another enormous offensive at Ypres had brought peace no closer than had the previous summer’s effort on the Somme. The failure to break through or even hold on to ground captured at Cambrai only added to people’s disappointment, as we have seen recent blog post. As noted in that blog post, the annual debate at Talbot House (in Poperinge, Belgium) on whether the war would end by the end of the coming year had registered a strong ‘yes’ vote in 1916 and 1917. The vote in early 1918 produced a tie, with only the chair’s casting vote producing an overall affirmative resolution that the war would end in 1918. An interesting echo of Oliver’s observation from the start of 1915 comes in a Mass-Observation survey in November 1939. Only 19% thought that it would last three years (considerably more than before the government’s prediction of a three-year war was publicised), whereas 21% expected it to last ‘nine months to two years’ and the same proportion thought that the war would be over in less than six months, only two decades after the 52-month Great War! The report noted ‘the exceptionally high proportion [29 percent] who can’t answer’, many of whom had ‘thought there would never be a war and since its outbreak have been wishfully thinking it away’ Similarly there were predictions from 1942 at least that the war would end within the year, while battlefield victories boosted confidence in an imminent peace. Of course we all now know that the war ended on 11 November 1918 (or at least the fighting on the Western Front ended then, the peace was signed in July 1919 and actually legally came into force in 1920). One thing that makes contemporary diaries both interesting and at the same time hard to become entirely lost in is that we know when the big battles were to come and when peace would finally return, when those living through the war obviously could no know either. It is very hard for us now to know how it felt to be in, say, November 1916 not knowing that the war would last for another two years. That people withstood the hardships of such a protracted and unpredictable conflict is hugely impressive. The beginning of a new calendar year prompted widespread expectations (or perhaps more accurately hopes) of peace within 12 months – before the end of the year or by Christmas. From 1915 to 1917 this was a common feature in British morale; ironically, 1918 appears to have been an exception and peace seemed further away than ever.